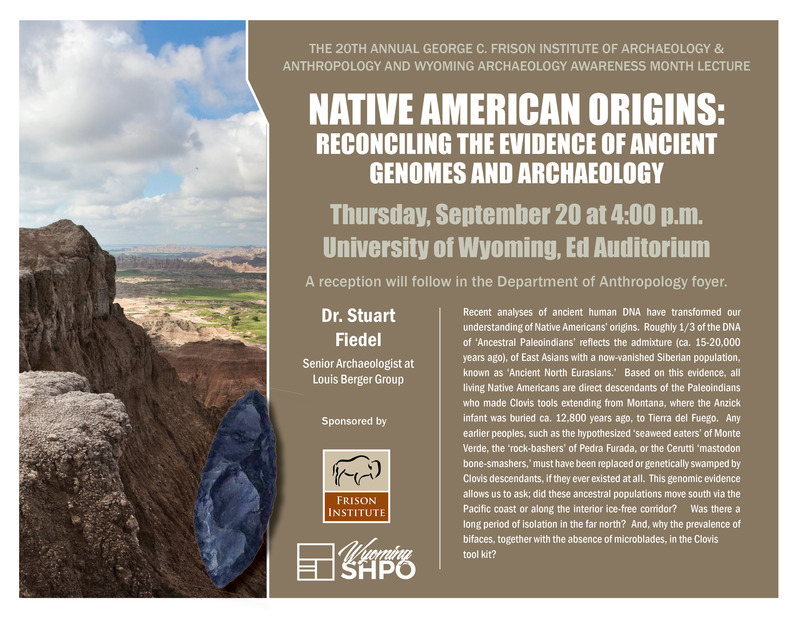 As a public service, the Institute, along with the Wyoming Association of Professional Archaeologists and the State Historic Preservation office sponsors a public lecture each fall near the end of September in conjunction with the fall board meeting. These lectures are given by a prominent archaeologist, but are aimed at a general audience. The lectures are free and open to the public. 2018: Dr. Stuart Fiedel, Louis Berger Group, Native American Origins. 2017: Dr. Charles Stanish, University of California at Los Angeles, New Insights on the Nazca Lines of Ancient Peru. 2016 Dr. Bonnie Pitblado, University of Oklahoma, The Role of the Rocky Mountains in the Peopling of the Americas. 2015 Dr. Stephen H. Lekson, University of Colorado, Boulder, A Millennium on the Meridian: One Thousand Years of Political and Ritual Power in the Ancient American Southwest. 2014 Dr. Jon McVey Earlandson, University of Oregon, From Coast to Coast: New Insights into the First Peopling of the Americas. 2012 Dr. Curtis Marean, Arizona State University, Survivors on the Edge of Land and Sea: Modern Human Origins and How Coastal Life Helped Make Us Unique. 2011 Dr. Mary Stiner, University of Arizona, Hunters of the European Late Lower Paleolithic. 2010 Dr. Ted Goebel, Texas A&M University, The Beringian Origins of the First Americans: Do Genes, Bones, and Stones Tell the Same Story? 2009 Dr. Janine Gasco, California State University at Dominguez Hills, Cacao Production and the economic and social role of chocolate in Mesoamerica. 2008 Dr. Gustavo Politis, University of La Plata, Argentina. 2007 Dr. Mark Aldenderfer, Arizona State University, high altitude adaptations in Tibet. 2006 Dr. Gary Haynes, University of Nevada, Reno, Clovis as a colonizing population.